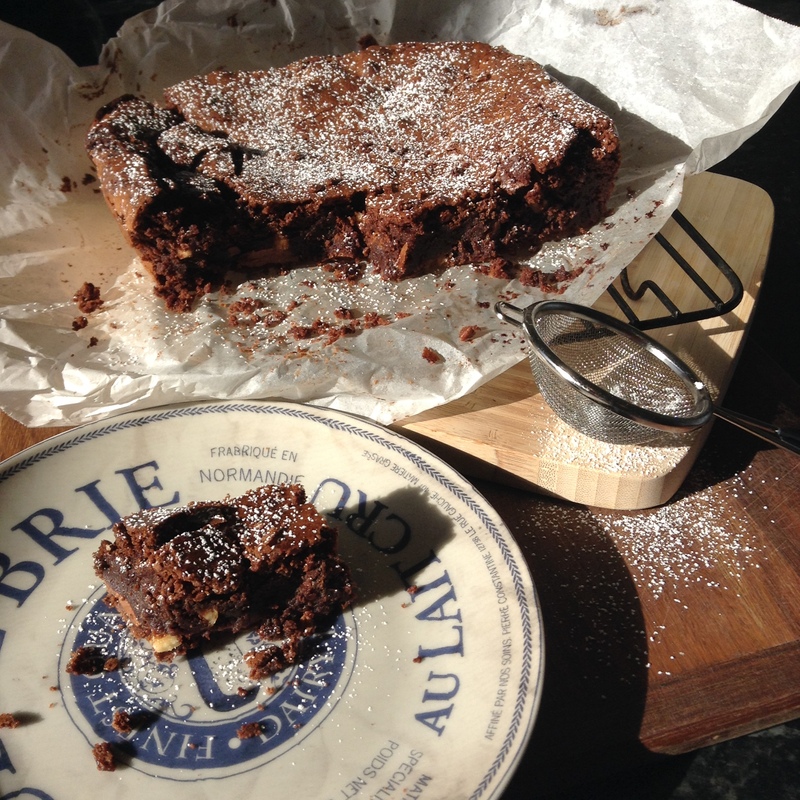 Three Chocolate and Hazelnut Brownies are one of the best tasting things that has ever come from my oven – and I have cooked some mighty fine pork in that bad boy. I also like to call them the Houdini Brownie as they instantly disappear once they are made. They are super easy to make, even easier to eat and the ingredient combination can be changed to suit your preference. Me, I think this combo is perfection so I wouldn’t recommend changing a thing. Preheat a fan forced oven to 160C and a line a 2ocm square baking tin with baking paper. Scatter hazelnuts evenly on another baking tray and place in the oven to roast for 5 minutes or until the skin is starting to peel away and toast. Remove hazelnuts from oven, allow to cool and place in a tea towel. Fold the edges in of the tea towel to form a sack and rub the hazelnuts to remove the skin. Discard the skin, roughly chop the hazelnuts and place into a small bowl. Combine butter and dark chocolate in a large, microwave safe mixing bowl. Place in the microwave on medium-high heat and melt, stirring at 30 second intervals. Allow the butter and chocolate mixture to cool completely to room temperature. Do not be tempted to place the mixture in the fridge or freezer as this may lead it to separate and for ice shards to appear. Break the 3 eggs into a medium sized mixing bowl, add caster sugar and whisk using electric beaters for 5-8 minutes, or until the mixture doubles in size and becomes thick and creamy like a milk shake. Ensuring the butter and chocolate mix is fully cooled to avoid the egg from scrambling, add the egg and sugar mix to the chocolate and butter mix and gently fold together using a rubber spatula. Don’t be tempted to over mix or you will knock out all the air from step 6, you want the mixture to still be streaky with the majority of the chocolate incorporated. Sieve the cocoa and flour into the milk and fold through until just mixed. All the chopped hazelnuts and milk chocolate melts, folding until they are dotted throughout. Pour the mixture into the prepared tub and use the spatula to smooth over the top. Place in the oven to cook for 30 minutes or until the middle is set, the top is crisp and flaky and the sides are begging to come away. It will still be gooey in the centre so don’t worry about the skewer test! Allow to cool completely in the tin and remove by lifting out the baking paper, cut into squares or cubes and watch it disappear! Oh man, they do look amazing! Dollface, I’ve nominated you for the Very Inspiring Blogger Award!! !